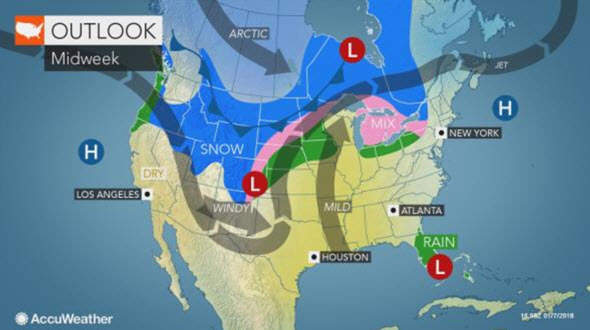 (1-7-18) AccuWeather Global Headquarters – January 7, 2017 – AccuWeather reports a swath of snow, ice and rain is forecast to develop and spread over a large portion of the central United States as arctic air retreats into early Monday. A weak storm will move out of the Rockies and grab moisture from the Gulf of Mexico, while a weak storm drops southeastward from the Canada Prairies. Even though the air temperature is forecast to climb to or above the 32-degree Fahrenheit mark from the central Plains to much of the Midwest, the ground will remain below freezing in many areas during the first part of the week. Rain fell and came into contact with a cold ground on Sunday across parts of Missouri, Illinois, northern Arkansas and southeastern Iowa. Some surfaces became icy as a result. The same conditions are likely to continue in parts of Illinois and spread across portions of Indiana, Ohio, Kentucky and Tennessee Sunday night. Just enough freezing rain or drizzle is likely from Interstate 80, southward to part of the I-24 corridor to raise the risk of dangerous black ice. Untreated roads, sidewalks and other cold surfaces may become icy in Davenport, Iowa; St. Louis and Springfield, Missouri; Chicago, Quincy and Mount Vernon, Illinois; Indianapolis and Evansville, Indiana; Cincinnati and Dayton, Ohio; Louisville and Lexington, Kentucky; and Nashville, Chattanooga and Knoxville, Tennessee. Mostly snow or a mixture of snow and sleet is forecast north of I-80. Snowfall will tend to be light, with a coating to an inch or two in most cases. Airline delays related to deicing activities and slippery runways are possible at the major hubs in Chicago, Detroit and Cincinnati. As the storm moves farther east, the area of snow and ice will follow suit. Areas from around the southern Appalachians to the mid-Atlantic can expect a period of freezing rain for a time spanning late Sunday night into Monday. The storm will bring some much-needed moisture to parts of the Plains and lower Mississippi Valley. Much of this swath has been experiencing increasing dryness or building drought conditions. Widespread heavy rainfall is not expected from the storm. Another round if ice may occur at midweek, but farther to the north over parts of the Great Lakes on Tuesday night and Wednesday. This will precede an even stronger push of mild air, while a snowstorm ramps up over parts of the Plains and Upper Midwest.